A remarkable and unprecedented phenomenon occurred amidst a political speech given by Bernie Sanders in Portland, Oregon on “Good Friday” March 25, 2016. An unexpected sparrow appeared onstage on the floor next to Bernie, and before a crowd of thousands. 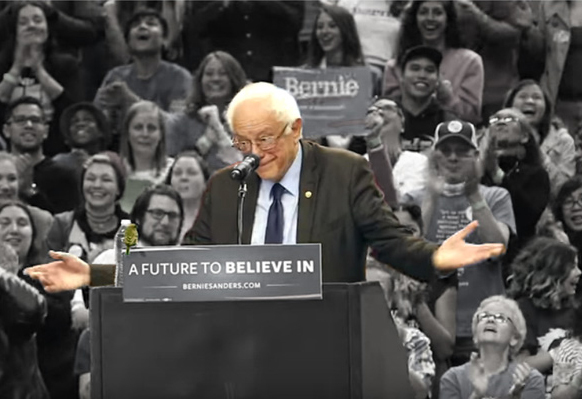 Instead of immediately flying away, the bird perched on the podium, looking at Bernie, as he smiled and gestured appreciatively to his feathered kindred spirit. The experience lasted amazingly long, about half a minute. Sanders declared the bird a symbol of peace, and no more war. Joy and delight lifted the spirits of all in attendance, and in millions who re-watched on Internet and TV. To the soul and symbolism deficient, the story ends there, a fluke, a joke, as meaningful or as meaningless as Trump bragging about his holdings, financial or genital. What such lost souls miss is any awareness of profound and multi-faceted synchronicity. To the urbane smug and clueless, Nature lacks intelligence and the ability to communicate with humans, and to them, ever-inferior “nature” doesn’t even merit upper case first letter status. To others, The Divine, if recognized at all, appeared in Nature long ago only as a biblical burning bush, miraculously not consumed by fire. For yet others, The Divine can be believed by some to have visited a human man’s skull, blessing the highly profitable, infernal civilian-toasting wars of a fiery Bush-in-chief. Some of us see things differently. For some of us, we live simultaneously in a world at once mundane, as well as soulful and spiritual. Certain times are more revealing than others, as is the case here. In matters of soul and spirit, there is room for alternate or simultaneous meaning, quite the contrast to the right-or-wrong of hard science, or the right-or-wrong heartless hard heads at Fox News. No war, holy or unholy, happens in the symbolic realm, where Jesus stories can coexist peaceably with the likes of medieval folklore and with timeless Nature lore. To appreciate the symbolic realm, no religious conversion is necessary, nor even belief or disbelief in a human historical Jesus. In his introduction to his 1994 classic book, Animal Speak, (the late) Ted Andrews writes that “…within most scriptures and mythologies of the world…. divine forces speak to humans through the natural world.” By page 2, we learn that “Birds have often been considered the symbols of the soul. Their ability to fly reflects the ability within us to rise to new awareness, bridging the earth and the heavens…. Birds each have their own peculiar characteristics, but they can all be used to stimulate greater flights of hope, inspiration and ideas.” Bernie’s bird, and ours at this time, is sparrow. Further, Leah tells us that the ancient Greeks considered sparrow as Aphrodite’s pet. Venus, the Roman name for Aphrodite, was overhead in the Zodiacal sign of Pisces at about Noon, the official start of Bernie’s presentation. Venus expresses Her Love most readily and completely being in the sign of Pisces, blessing Bernie, birdie, and the many thousands there in community in Portland. Astrologically, on that special day, several planetary characters celebrated together on high with lovely and loving Venus. In 1905, Civillia Durfee Martin wrote the lyrics to this classic gospel spiritual. The joyful spirit of twenty-year-bedridden Mrs. Doolittle of Elmira, New York was explained to Ms. Martin as, “His eye is on the sparrow, and I know He watches me.” Thus a song was born.